Thanks to a boom in shale oil extraction, the United States is now seen as the world’s biggest oil producer, pumping out 8.5 million barrels of crude per day in July. Trinidad drills in four different countries, but around half of our fleet is working in the thriving U.S. market. “We’re operating in most of the major shale basins in the U.S.,” explained Tom Horton, Vice President of Business Development and Contracts with Trinidad Drilling’s U.S. division. Here is an overview of Trinidad’s U.S. operations. Horton explained that half of Trinidad’s U.S. fleet is operating in Texas. Which makes sense – half of all rigs operating in the U.S. are in the Lone Star State. “One of our larger presences and a growing presence for us is in West Texas. We’re consistently adding rigs there,” said Horton, who explained that the Permian in West Texas is by far the largest oil-producing basin in the U.S.
Horton also pointed out that Trinidad is focused on adding rigs to the Tuscaloosa Marine Shale play in Louisiana/Mississippi and to the Eagle Ford Shale area in Texas. “If you look at the Eagle Ford in South Texas, there is a plan to add a million barrels a day in production between now and 2020. That is a lot of production to be added,” said Horton, explaining the reason it is a target market for Trinidad. 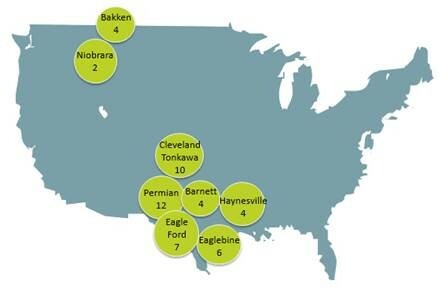 Farther north, Trinidad currently only operates a handful of rigs in the Bakken. However, Horton explained that Trinidad plans to move additional rigs to the booming North Dakota oilfield. “Our goal is to have a portfolio of rigs working in each of these (major) areas,” said Horton. Join a team that is committed to safety and to growing your career as we grow. “We are currently recruiting good hands who are interested in a career with Trinidad,” said Michael Arora, Manager of Human Resources with Trinidad’s U.S. division. Apply for a job with Trinidad Drilling today. Want information on our U.S. benefits plan? Read this post. *Trinidad Drilling is also hiring for positions in Canada, Mexico and Saudi Arabia.